Premium chocolate products delivered straight to your door? YES please! Each of our Bedré Boxes contains beautifully crafted Bedré Fine Chocolate products made to satisfy every cocoa craving. Whether it’s a well-deserved treat for yourself or a gift for family and friends, our Bedré Box is perfect for every occasion. Bedré Box is offered as a yearly subscription that is billed bi-monthly. The subscription consists of six curated boxes filled with hand-picked gourmet chocolates, shipped directly to you every two months. Shipping to a friend? No problem! You can have the Bedré Box ship directly to them. A Bedré Box subscription includes FREE shipping and each box is carefully put together and includes cold gel packs to keep your chocolate fresh. Indulge in delicious assortments of Bedré Fine Chocolate products and subscribe to the Bedré Box today for $239.70. That’s only $39.95 per box! The Bedré Box is billed on the 5th of each month that it is scheduled to go out, and ships on the second week of that month. *Shipping dates may vary. If you are shipping outside continental U.S. or have any questions, please call 800-367-5390. Our customer service representatives are ready to help. Can I find out what will be in future Bedré Box shipments? Each Bedré Box is a surprise! Bedré Box contains a handmade item in each box, as well as a combination of your favorite Bedré Fine Chocolate treats, such as bars, Meltaways and more. Can I request a box with customized contents? Bedré Box provides a sampling of Bedré products with different selections every other month, but does not create custom boxes. However, you can place separate orders by calling 1-800-367-5390 or visiting bedrechocolates.com. If I have allergies, can I order Bedré Box? At this time, Bedré Fine Chocolate does not have an allergy friendly box. While many products we carry do not contain allergens, they are processed in the same facilities as products that do. Are there any credit card processing fees? Bedré Box subscription does not charge any additional fees; $39.95 is all that will be charged to your card, no taxes or shipping charges will be added. Can I choose the date I would like to be charged? We will charge all credit cards one week before the subscription box goes out. Can I request a vacation hold? 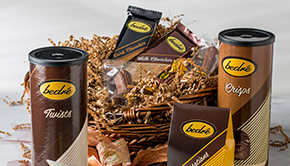 Yes, please sign into your online account or call Bedré Fine Chocolate’s customer service department at 1-800-367-5390 no later than the 1st of the month the delivery is to take place (February, April, June, August, October, and December) to let us know when you would like Bedré Box shipped. Please call Bedré Fine Chocolate customer service at 1-800-367-5390 and a Bedré Box will be shipped out that day, or the next business day. What if my Bedré Box arrives damaged or melted? We do our best to ensure each Bedré Box is delivered in pristine condition. If your Bedré Box arrived damaged, please be sure to contact Bedré Fine Chocolate customer service at 1-800-367-5390. How do I opt out of Bedré Box? You may update your personal information or opt-out by logging into your online account or by calling 1-800-367-5390. Updates to personal information or opt-out requests will be handled immediately.